CANTON, OH. 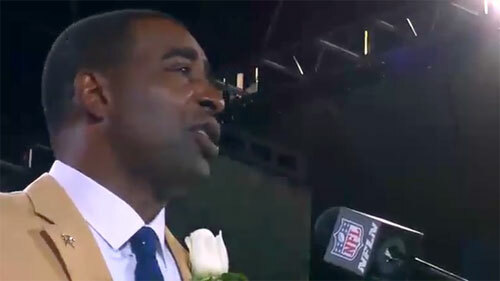 — Former NFL wide receiver, Cris Carter, was recently inducted into the Pro Football Hall of Fame and honored at the 2013 Enshrinement Ceremony that was held on Aug. 3, 2013 at Fawcett Stadium in Canton, Ohio. Carter became the seventh and final inductee following Jonathan Ogden, Dave Robinson, Larry Allen, Bill Parcells, Curley Culp and Warren Sapp. The award was presented by his son, Duron. In an emotional speech Carter said, “I appreciate the process that you have to go through to be a Hall of Famer. I’m so glad regardless of whatever you’ve done it’s not a slam dunk. We have the greatest Hall of all the Halls and to be able to join these men, on this stage, in football heaven, is the greatest day of my life”. Carter was drafted by the Philadelphia Eagles in 1987, but was let go by coach Buddy Ryan in 1989, due to substance abuse issues. When Carter was signed by the Minnesota Vikings in 1999, he was able to turn his life and career around, becoming a two-time First-team, one-time Second-team All-Pro and playing in 8 straight Pro Bowls. When he left the Vikings after 12 years in 2001, he held most of the team career receiving records. He had a short stint with the Miami Dolphins in 2002 before retiring. After his retirement, Carter became one of the hosts of HBO’s Inside the NFL and is currently an NFL Analyst for Yahoo Sports and ESPN. Cris Carter is also an ordained minister, motivational speaker, keynote speaker and one of our more popular Christian speakers, says Sports Speakers 360. He was a speaker at the 2008 NFL rookie symposium and again at the 2009 NFL Rookie Symposium. If you would like to book football speakers like Cris Carter for a speaking engagement, autograph signing, product endorsement, Super Bowl party, golf tournament, charity fundraiser or special event, you can request Cris Carter agent and speaker fees at Sports Speakers 360. For booking agent and appearance fee information on how to hire Minnesota Vikings players for appearances, call 1.855.303.5450.